I have a super easy and very yummy cake recipe for you. It is so simple even the kiddos can help make it. This is a recipe for a 2 ingredient pineapple cake. Yep you read that right, it has only two ingredients in it! Simple right? This is a very light and fluffy cake that you will enjoy too. Lower the oven rack to the lowest setting. Then preheat oven to 350. Now in a large mixing bowl combine the ingredients. Be careful not to over mix. Now grease a bundt pan with either butter or baking spray. Pour mixture into greased bundt pan. Bake for 45 minutes. Remove from oven and allow to cool 10 minutes in pan. Then use a spatula to carefully loosen the sides from the bundt pan. Place a platter over the pan and flip over. Let stand for a few minutes so that it releases from the pan. Remove the pan and allow to finish cooling. Serve on its own or top with some whip cream or vanilla ice cream. This cake is so light it is great for a spring and summer time treat. 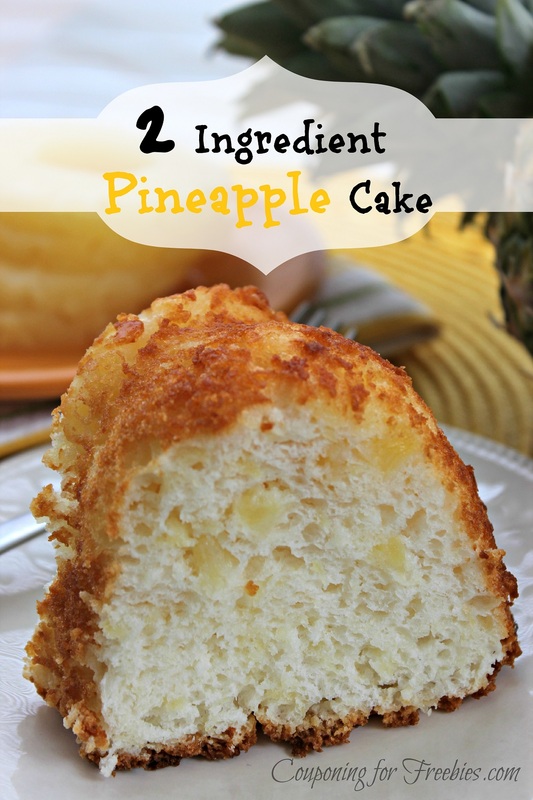 Did you like this 2 Ingredient Pineapple Cake Recipe? If so be sure to check out more of our recipes over in our recipe category! There is a little bit of everything from ideas for breakfast to hors d’oeuvres. We even have some gluten free recipes too.